Some years ago our church, like too many others, was in decay. Bickering and backbiting over personal, pastoral and doctrinal issues had supplanted the Word of God as its guiding light. Nearly everyone had become sad, sin-sick and discouraged. A new pastor came, and one Sunday morning during Adult Forum, declared we were going to study the Bible. Since no one brought their own, we scrounged around to fi nd enough Bibles for everyone and came up one short. I happened to look in the church foyer where there was a dust-covered shelf serving as a repository for old bulletins, some lost-and-found items, out-of-date hymnals and, in the corner, one small Bible. 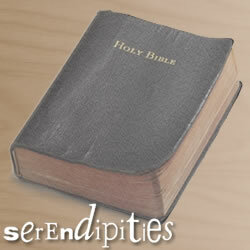 I brought the Bible back to where we were holding our study and made a big deal of blowing a cloud of dust off it. The pastor said, “That’s one problem we’ll be fixing.” With the reading of God’s Word, healing and restoration began that morning. Four months later I wrote this poem. sat unopened on a shelf. help make them whole again. speak to them in His name. needing soil to reach the sky. to plant God’s divine seed. and washed away their sin. with Jesus Christ’s good news.